As in my previous post was announced, this year will start school (on Facebook) where I will try to teach all attendees on everything necessary to make their own amigurumi and write the pattern. In the group we will talk and practice more on how to make a doll but these lessons, that I will regularly post here on the blog, can be implemented in any toy you wish to create on your own. My class is starting next week. I am sorry I can’t invite all of you to join, but you have to understand that I physically can’t follow you all (even though I would love to be a super woman with super powers 😀 ). Students will have practical work to do which I have to follow by making samples after them, in order to guide and help them best I can. Right now there are 100 of them who joined and even that is way above what I can physically take. In the future there will me more of such classes, which you will be able to attend and ask whatever you might need help with. Everyone who knows how to make single crochet, increasing or decreasing stitch can make amigurumi toy! There is a lot things to explain. I will take my time to describe and bring it to you in the most simple possible way in order to make you understand how all this works. It is not just knowing the shapes. All of you know how to make a cylinder or round shape, but for many it is still taboo when it comes on taking the hook and starting to make something from scratch. Once you understand and become familiar with what happens if you start with certain number of stitches in the magic ring and what you are doing with increasing/decreasing during your work, or why sometimes patterns start with chain….. then you will be able to start your work and direct it in the way you imagined and make doll you wish. Understanding these basics, and with little practice, in no time you will be making your very own toys and creating your very own patterns. Read, make notes, practice. That is the best way to learn. 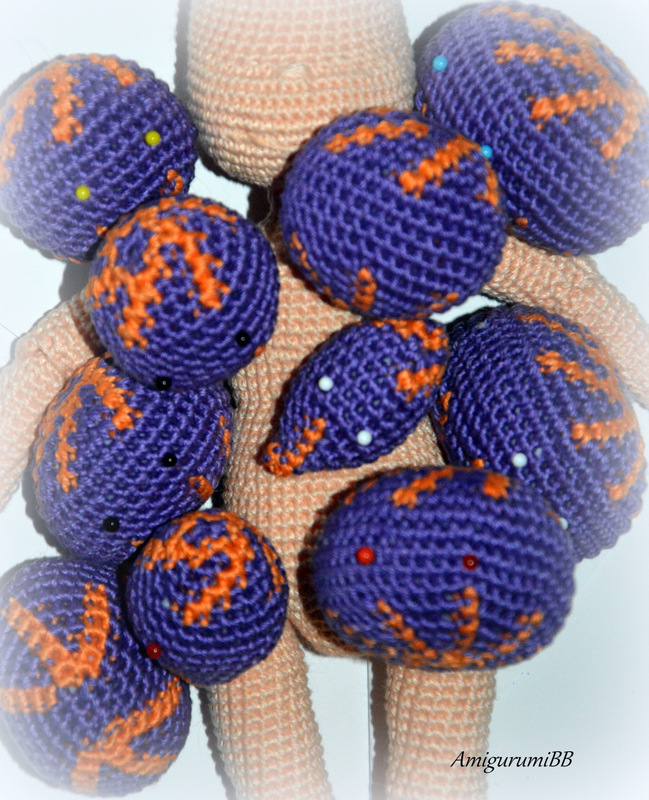 Each lesson I will add as post, and will add new page you can open on it’s own and read only on these posts and Amigurumi Philosophy (as I like to call it). You can leave your comments there and ask questions and I will do my best to reply them and help you if I can. Even though I will try to write about all I know, there will be things I might miss. It is huge field to cover and I will work in details. Please feel free to write and ask me to explain something in your opinion I’ve missed. Lessons will be updated accordingly. Lessons will be divided in sections. Each part will be divided in mini lessons. For example, Part one and the basics on shapes and elements will be divided in round shapes to make you understand how to create the head (or the body), tubes, cylinders and ovals (body, legs, arms, necks and all other parts that can be created with these shapes). Basics on increasing and decreasing and amigurumi shaping (what happens when you increase or decrease evenly every round, every second or every third round…..
Last lesson in Part one will talk about sewing parts together. As you can see, there is no lesson on how to write the pattern. I haven’t forgotten about it, but once you understand Amigurumi Philosophy and learn these basics, writing the pattern will follow naturally. All you will need is to write down your idea and try to crochet one. Part two is more advanced. It is not taboo, and as with basic lessons, I will break the advanced ones to easy to follow details as well. Each sample will be photographed and pattern will be explained. This will give you opportunity, not just to see how something is done, but to try to make and learn yourself. In my online classes I will have little tests for my students. Will try to make few for you too. Simple tests to make you practice and help you improve what you have learned. Don’t forget to come weekly and check up on new lessons! First lesson is about round shapes. What difference does it make if you start in circle or with chain? Does it matter with how many stitches you start? Continuous rounds or rows to work with? Answers to these and much more will be explained. Hello..i would like to join your next class..please add me and let me know how much it cost. Thank you..by the way…my name is madonna.